Google Chrome extensions are the best and easy way to increase the utility of the Google Chrome browser. If you are Google Chrome user and using some of the Google Chrome extension to improve the productivity. Despite this improved Chrome functionality, sometimes you no longer want them installed. So today here we will show you how to remove Google Chrome Extensions in this quick and simple guide. 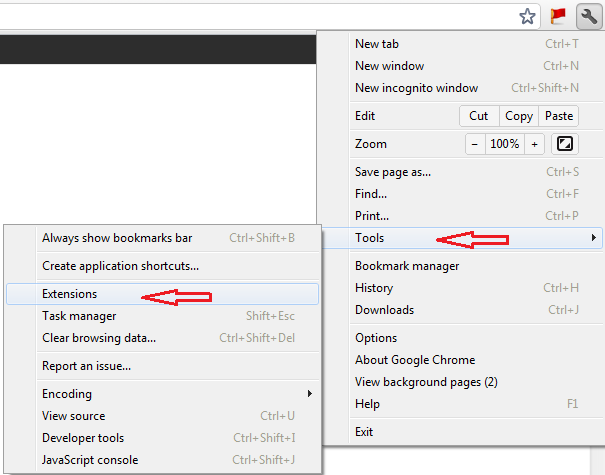 Here are the 2 simple methods which helps you to remove Google Chrome Extension easily. Open your Google Chrome Browser and type chrome://extensions in the Google address bar. This will open a page with the list of the chrome extensions that are installed. So from here you can uninstall them easily. 2. Click Tools and Select Extensions. 3 . Click Uninstall for the extension you’d like to completely remove. If you find any extension very annoying but still need it,just disable it.It can be enabled any time in future. The 1st method is very handy. I didn’t know about it. Thanks a lot!